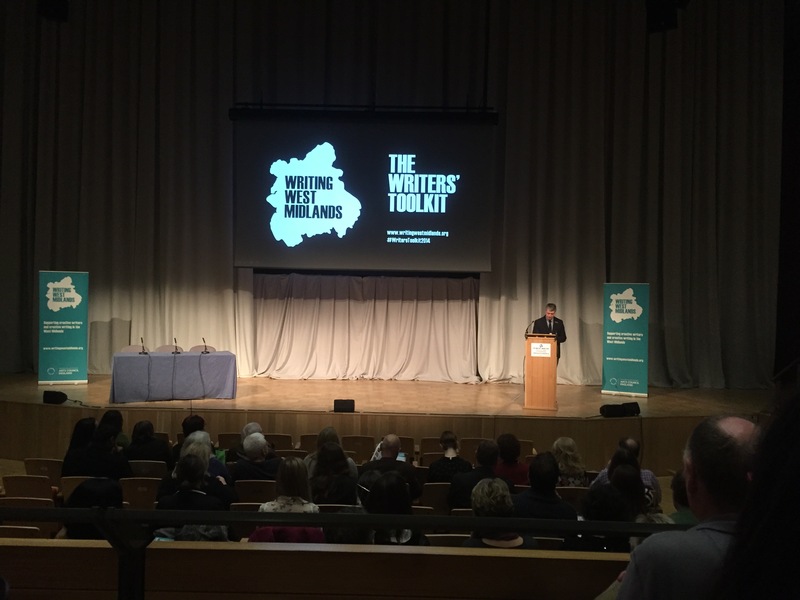 Writing West Midlands – Writers’ Toolkit Event. Chief Executive Jonathan Davidson opening proceedings (and doing a fabulous sales pitch on WWM tea-towels!). 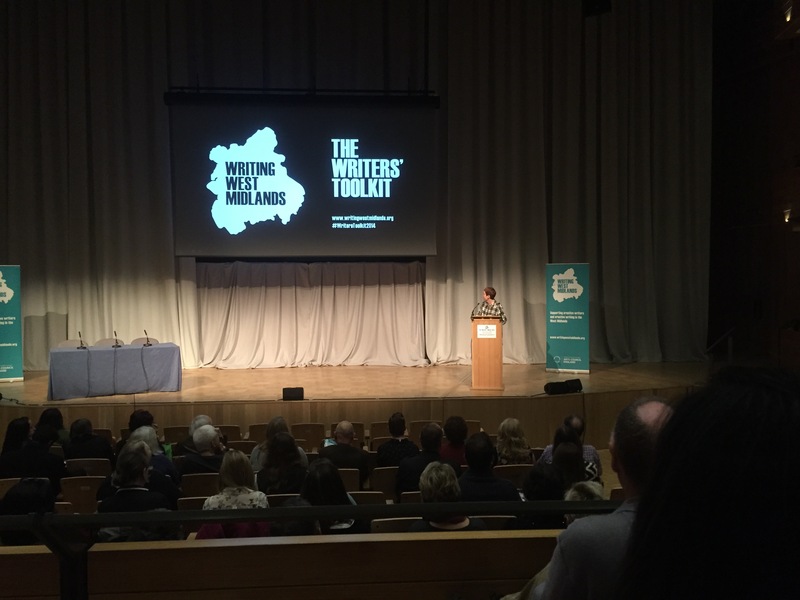 Towards the end of 2014 I took the opportunity to attend Writers’ Toolkit – an annual networking and discussion day run by Writing West Midlands. It was, I think one of the most enjoyable events of this kind I have ever attended and an event from which I have gained a boat-load of inspiration and ideas, in fact I came away from the event with a whole new direction for my writing. How’s that for impact? Kate Feld & Sathnam Sanghera lead the session “Make The Internet Work For You”. The keynote speakers were so very worthy of that title and panelists for the individual sessions were, well, without wanting to sound too much like a sugared-up fangirl high on gush, both fascinating and largely responsible for my metaphoric boat being awash to the gunwales with inspiration. In the past when I have attended events like this, although I do generally get something out of it, I often find myself moored to the walls, avoiding making actual eye-contact–accidental or intentional–and while not necessarily avoiding interaction with people, not exactly encouraging it. I drift around the periphery of proceedings watching–I mean, after all, that’s what writer’s do, isn’t it –watch people? The idea of getting stuck in and voluntarily entering into conversation with a total stranger, much less a whole bunch? Nah, not me–I would sooner dance barefoot over hot coals. On occasion, I’ve found myself feeling either over-awed and/or reduced to that uncomfortable deflated, post-event state, feeling like a mere wannabe, questioning my right to call myself a writer and sometimes, and I will say this, feeling that I’ve had my dose of condescension for the day from the literary glitterati delivered with a hollow smile and in a ‘there-there‘ tone reminiscent of the one my grandmother used every time I fell off my tricycle. 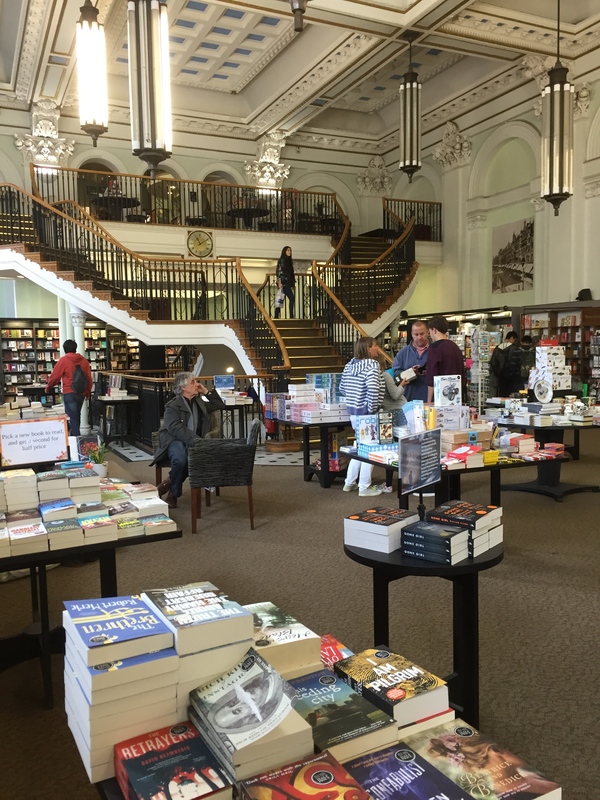 How could anyone resist a bookshop like this? And yet, on the train back home from Writers’ Toolkit, it struck me that I had spent the entire day well and truly cast adrift from my moorings. I had interacted with delegates, posted Tweets about what a great day I was having, and –shock! horror! –conversed with speakers who were both generous with their time and incredibly helpful with their comments, advice and suggestions. I had an armful of notes and information, a number of new contacts in my address book–OK and yes, I had the obligatory speaker’s book duly inscribed–this one though, being top of my reading list instead languishing, likely forever unread, on one of the stacks in my office. [Readers may remember my pledge last year to cease and desist from my one-woman bid to save the print industry by calling a moratorium on buying any new books for the remainder of the year. In my defence, I took the pledge before I knew how many trips I would be making to Birmingham over the course of 2014 and that my route to the offices of Writing West Midlands would take me past two enormous Waterstones bookshops — (and now I hear that a Foyles is on the way…I should probably book my place in bibliophile rehab sooner rather than later).] It took me a while to figure out what was different this time and I have concluded it boils down to a very simple fact: I put more in to the day and as a result got way more out. Not exactly rocket science I know, but nonetheless revelatory. I would hazard a guess that for most writers, even the most garrulous, the thought of ‘networking’ probably leaves them cold, perhaps it sounds too corporate, too ‘in your face‘, too altogether pushy. I know my own temperature on such activities was definitely south of frigid. 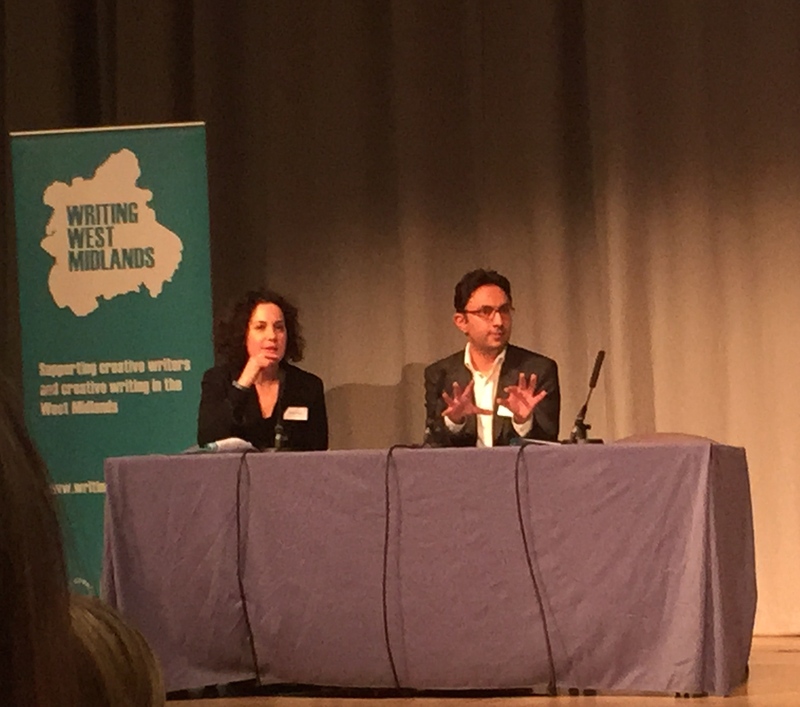 During the last year however, my involvement with Room 204 allowed me ongoing contact with both the staff at Writing West Midlands and my cohort of fourteen other writers from around the West Midlands. Like ripples in a pool, that contact has expanded to include members of previous cohorts, contact with new people outside Room 204 and so on. And so when I attended Writers’ Toolkit, I was not walking into the unknown; many of the people I had come to know and enjoy over the year were there; I was among friends and kindred spirits, relaxed and confident in my own skin and most importantly, nowhere near the wall. What a difference it made–the difference between being part of something and a bystander. I know, which I prefer. So what’s the deal with this networking business? Here are 10 things I believe are important and although there’s a very West Midlands flavour to this post, the principle applies wherever you are. For the UK, here are some useful links: Arvon and The Poetry Society, Writing East Midlands, New Writing South and Literature Works (South West). 1. Attending a networking event for the first time is a little scary. That isn’t a valid reason not to attend. Most people start out feeling awkward, hating the idea of it and unable to see the point, no matter what their background. Nobody leaves the womb as a fully formed networker, it’s a skill that can be learned and developed and like any other, the more you do it, the easier it becomes. You don’t have to be a dazzling conversationalist but do give others the opportunity to get to know you. If you make it hard for people, they will move on and forget you. 2. It is not an ‘in your face‘ process, you’re not selling a commodity or even your books at a networking event – that’s not the point of it. You’re building relationships, some of which may even become long-lasting. You are forming a network that at its core can and will provide support, encouragement, ideas, critique or further contacts; it can tip you off to an opportunity that might just change your life or simply be shoulders to cry on when you get slammed by a rejection letter. Some people in your network may even buy your book, just because they want to. 3. Nobody likes a blabbermouth. Networking is a two-way process. Giving support and encouragement to others is so much more rewarding that making it ‘all about me‘, it’s no different in that respect than any other relationship. 4. Conversely, if you find yourself stuck with a blabbermouth unable to get a word in, ask yourself a simple question. Can I handle this without sticking a fork in them or smacking them on the nose with a rolled up newspaper? If the answer is yes, well done you because you have won the booby prize and are destined to spend the rest of the event with said blabbermouth stuck to you like a barnacle to a ship’s hull while everybody else gets on with networking. If the answer is no, move on, don’t let someone like that sap your energy, miss opportunities to talk to others or cause you to get locked up for common assault. Of course, the person could just be extremely nervous and that nervousness working itself out in raging torrent of words. A torrent normally slows of its own accord, Mr/Ms All About Me however, is relentless and indefatigable. It has been my experience that you can quickly learn to spot people who are only interested in themselves and what others can do for them, without actually contributing anything to the network. Give them a very wide berth. 5. Business cards – who needs ’em? As I discovered to my chagrin last week at a networking event, when I arrived without any, it is always good to remember to take them — they don’t have to be anything flashy, or even business cards, your contact details printed on a sheet of paper work just as well. 6. Just like love, it’s a verb. Be proactive, ask questions (it’s the quickest way to get to know people), smile and above all listen. You will miss so much hugging the wall and staring at the bottom of your coffee cup. A single conversation could open a door for your writing career, send you off on a new pathway in your work or spark an idea that could help you unstick a problem character or scene. Just the simple knowledge that on your darkest days, staring at a blank screen unable to string together a coherent sentence, you are far from alone and there’s someone you can call up or email, is worth the going through that awkward newbie stage when you first start out networking. 7. Be yourself (unless of course, yourself is a blabbermouth, in which case bring duct tape too), be genuine show it by having a real interest in the people you meet. Be prepared to share and listen, listen, listen. 8. Follow up. A promise undelivered dents credibility and is the quickest way to damage trust. Strong networks require a foundation of trust in order to flourish, letting someone down when you promise to follow-up, turn up or do something drives a wrecking ball through that trust and will ultimately destroy the cohesion of the network. 9. Be in it for the long-haul and become a regular attendee. Networks take time to establish and cultivate, you have to work at it but let’s face it in the history of mankind, it has never been easier to communicate with others. I can’t over-emphasise this enough, you will get out what you put in. If you leave and nobody knows your name you’ve missed an opportunity. If you speak in whispers, nobody hears. 10. You are a writer not a wallflower, ergo you have something to say. Painful shyness has to take a backseat if you want to network, I’m afraid. There is no easy way around it, you have to venture beyond the warm, fluffy safety of the comfort zone. People need a compelling reason to want to network with you, if all you bring is your Linus blanket to hide under, they’re going to forget you’re there. Be passionate about what you do and have a clear idea of what you want to achieve – you have an idea you think might work well on stage, but haven’t got much knowledge about the process of submitting scripts — seek out those who have done it before. Want to know about writing for radio? Ask the chap sitting next to you who’s done it before. Having trouble with your grant application? Ask the group if they know who could help you. Heard of a opening for a performance poet at your local pub? Tell the group. Be as gracious to newcomers as the group was to you and above all – have fun and remember you really do get out what you put in. It all sounds easy in theory, much harder in reality, I know (believe me, I know! ), but ask yourself this…what have you got to lose by giving it a go? For those West Midlands based writers, there’s a Networking event coming up on 14 March in Dudley. I’ll be there, will you? And so that’s it for now, wishing writers everywhere a week of progress, one word after another. 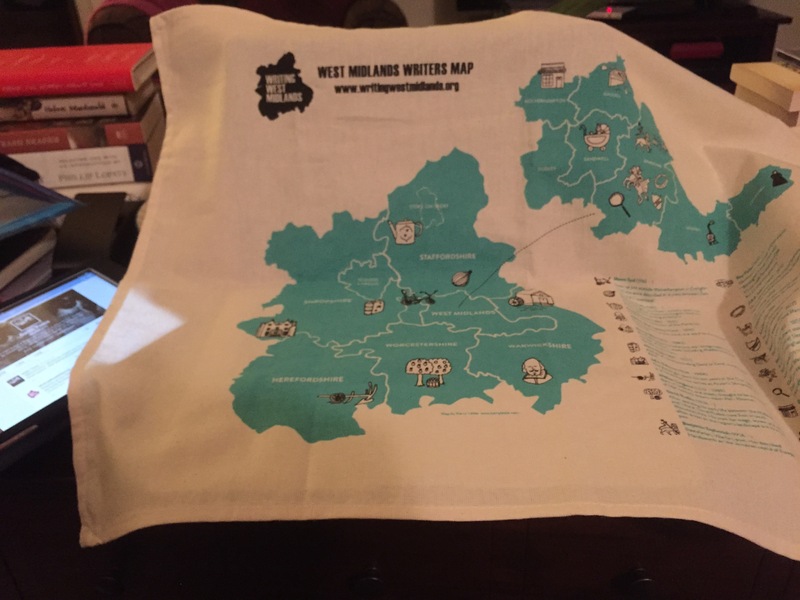 The essential Writing West Midlands Tea Towel – no Writer’s Toolkit should be without one!